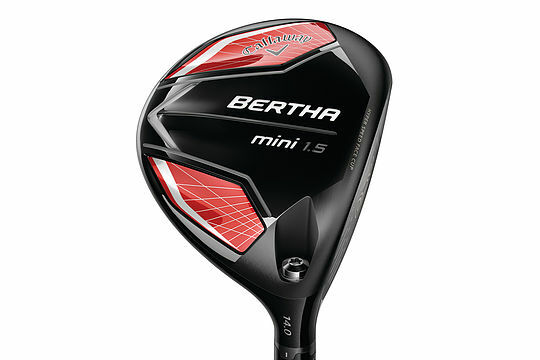 The Bertha Mini 1.5 is a new type of weapon from Callaway designed for any player looking for a reliable option off the tee while staring down a tight par-4 or par-5. Engineered with all the features you love about a driver in the body of a bigger fairway wood, the Bertha Mini 1.5 is longer than Callaway’s traditional 3-wood. In fact, the 235cc club head is 35 percent larger than Callaway’s new XR Fairway Wood, with greater MOI and a shape that delivers confidence over the ball. High ball speeds won’t be a problem thanks to a Forged Hyper Speed Face Cup, low spin off the tee and a Forged Composite crown. Better players will love the way the cambered Warbird Sole performs off the deck, and a 44-inch shaft (two inches shorter than a typical driver shaft) makes it easier to hit. Callaway’s patented OptiFit Hosel allows you to choose from eight different combinations of loft (-1, S, +1, +2) and lie angle (Draw or Neutral) so you can play it like a driver or fairway wood. It’s a Bertha with versatility.